As the new year approaches, I'm excited that I am adding events to the calendar. Gate City Natural Hair has asked me to be the speaker at their January Lunch 'n Learn on Saturday, January 25th at 1 p.m. at EM Creative Fitness in Greensboro. 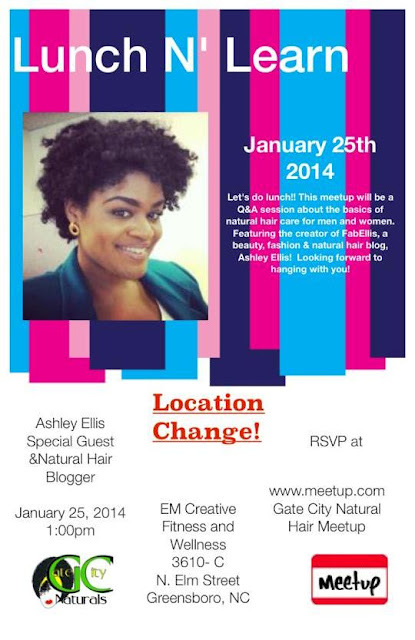 This event is going to be a question and answer session where I will be talking about beauty, fashion and natural hair. The best thing about this event is that it's FREE. I'm really excited about this event because I love meeting new people and small, intimate events. I hope to see you there! Are you coming? What are some questions you would ask if you attended?